Now that Halloween is over we can get going on that holiday menu planning! If you have a small(ish) family like ours, you may be finding that serving ALL of the traditional dishes just isn't feasible without resulting in a ton of uneaten leftovers. One of these dishes in our family is the infamous Green Bean Casserole. While it's delicious, it's no one's favorite, so it often ends up forgotten. But this year, I want to bring back the love. In an appetizer form. And I present to you, the Green Bean Casserole Dip. All of the fabulous flavors, I promise you. Just offered before the bird. Preheat oven to 350 degrees. Melt butter in a nonstick skillet over medium high heat. Add garlic and onions and saute until softened. Add mushrooms and cook until softened, 3-4 minutes. Season with salt, pepper, and soy sauce and cook for additional 2-3 minutes. Transfer mixture to a food processor and chop finely. Add yogurt and cream cheese and mix until a puree is formed. Add more salt and pepper to taste, if desired. In a medium mixing bowl, add chopped green beans, then stir in pureed mixture and parsley. Transfer mixture to an oven-safe baking dish. Top with crispy onions. 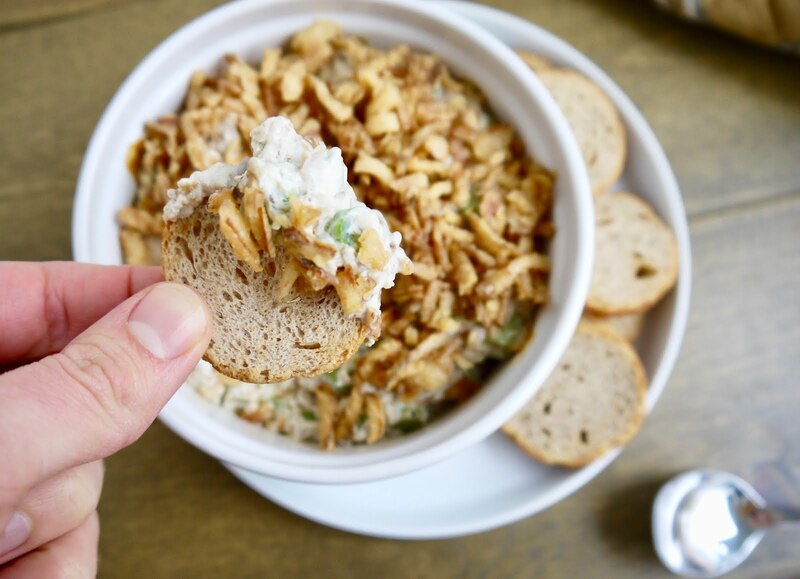 Serve with melba toast, slices of sourdough, or other crackers of your choice.